This article is about the Turkish dish. For the Arab version, see Shawarma. For Greek version, see Gyro (food). Not to be confused with Kebab. Döner meat being sliced from a rotating spit. The meat is cooked by burning wood embers behind the spit. Döner kebab (/ˈdɒnər kəˈbæb/, /ˈdoʊnər/; Turkish: döner or döner kebap, [døˈnɛɾ̝̊ ceˈbap]) is a Turkish dish made of meat cooked on a vertical rotisserie, normally lamb but also a mixture of veal or beef with these, or sometimes chicken. The sliced meat of a doner kebab may be served wrapped in a flatbread such as lavash or pita or as a sandwich instead of being served on a plate. It is a common fast-food item not only in Turkey but also in the Middle East, Europe, Canada and Australia. Seasoned meat in the shape of an inverted cone is turned slowly against a vertical rotisserie, then sliced vertically into thin, crisp shavings. On the sandwich version, the meat is generally served with tomato, onion with sumac, pickled cucumber and chili. Cağ kebabı, a related dish. Note that the meat is horizontally stacked. Before taking its modern form, as mentioned in Ottoman travel books of the 18th century, the doner used to be a horizontal stack of meat rather than vertical, like the cağ kebabı of Erzurum. Grilling meat on horizontal skewers has a very ancient history in the Eastern Mediterranean, but it is unknown when slices of meat, rather than chunks, were first used. In his own family biography, İskender Efendi of 19th century Bursa writes that "he and his grandfather had the idea of roasting the lamb vertically rather than horizontally, and invented for that purpose a vertical mangal". Since then, Hacı İskender is known as the inventor of Turkish döner kebap. With time, the meat took a different marinade, got leaner, and eventually took its modern shape. A doner kebab is sometimes spelled döner kebap (the Turkish spelling), lit. "rotating roast", or can be shortened to doner (Turkish: döner), lit. "turn around", also spelled "doener", "donar", "donair", "doner", or sometimes "donner". In Greece, Doner Kebab is called gyros. The most common form of gyros is prepared with pork, due to its broad availability and low price in Greece. The name comes from Greek γύρος ("turn"), a calque of the Turkish name döner kebap; the dish was formerly called ντονέρ [doˈner] in Greece as well. Today, ντονέρ refers to gyros prepared with lamb or beef. While the Greek word gyro and the Arabic shawarma are often used in the Americas, in the UK, the Turkish word döner is almost universal with few exceptions, although (unlike in Germany where it is normally seen spelled döner) it is normally spelled without the umlaut over the "o" as doner. The word shawarma /ʃəˈwɑːrmə/ is believed to have evolved from the Turkish word çevirme [tʃeviɾˈme], a synonym of döner ("turning, spinning, rotating") and is used in most Arab countries as well as those Latin American countries where there are colonies of Arab emigrants from the Ottoman Empire. Shawarma is, almost always, made of lamb though. In Turkey the dish is usually called simply döner rather than döner kebap or döner kebabı, the latter of those being the most correct form in Turkish. In Armenian, it is tarna, literally meaning "to turn". Tacos al pastor ("shepherd style tacos") is a dish developed in Central Mexico, likely as a result of the adoption of the shawarma spit-grilled meat brought by Lebanese immigrants to Mexico. While döner kebaps and gyros outside Greece are made from lamb and beef, tacos al pastor in Mexico is made of pork, similar to gyros in Greece. İskender (specialty of Bursa, served in an oblong plate, atop a base of thin pita, complete with a dash of pepper or tomato sauce and boiling fresh butter) "Kebapçı İskender" is trademarked by Yavuz İskenderoğlu, whose family still runs the restaurant in Bursa. Döner served in a "tombik pide" ("fatty" pita) also called in Turkish: gobit. In Afghanistan, it is called shawarma. Döner is popular in Afghanistan and it is sometimes referred to as "Turkish kebab" or ("kababe Torki", Persian/Pashto: کباب ترکی), usually served with a variety of vegetables and a special yogurt sauce called "mast." In Armenia Ġarsi khorovats, šaurma or in the Armenian diaspora, "Tarna" (literally, "it turns"); it is usually lamb, pork or chicken on a vertical rotisserie, sliced and wrapped in Lavash, served with tahini, yogurt or garlic sauce and with a side dish of pickled vegetables or tourshi. In Azerbaijan, doner is called Shaurma (Aze: Şaurma) or Döner (Aze: Dönər). Şaurma is made with chicken and always include garlic sauce, whereas döner can be made with either chicken or beef, and does not include garlic sauce. Both can be served in bread, lavash or in plate. Döner also can be served in tandoor bread. The most popular variety is Turkish döner. In Bangladesh, shawarma, along with döner kebab, is becoming more popular mainly as a fast-food item in Dhaka and, to a lesser extent, in Chittagong. Fast-food shops such as Shawarma House and Arabian Fast Food have added shawarma in their menu. Doner is widespread in Western China, especially among Uyghurs. Doner is a popular fast food in Georgia, where it's known as "shaurma" (Georgian: შაურმა). Doner is popular in Iran, where it is known as "Turkish kebab" or ("kabab Torki", Persian: کباب ترکی) or "kabob Estanboli" (kebab from Istanbul). In Israel, it is called shawarma (Hebrew: שווארמה) and is available at restaurants, stands and fast-food restaurants. It is usually made with turkey and often veal is offered too. In Kazakhstan, doner has become popular since declaration of independence when Turkish business in Kazakhstan started to develop rapidly. 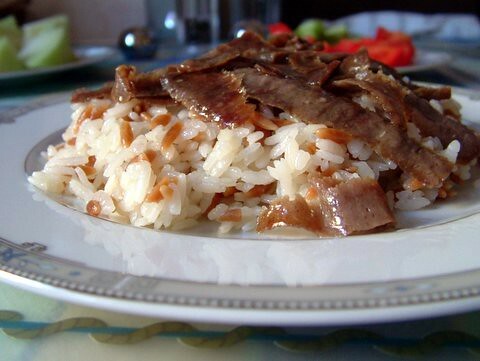 Now, doner is one of the most favorite types of fast-food in Kazakhstan, especially in Almaty, Shymkent and Astana. In Japan, doner kebabs are now quite common, especially in Tokyo. They are predominantly made of chicken but occasionally beef, and are often sold from parked vans. Called simply "kebab", they have been simplified to suit Japanese tastes; the salad is usually omitted in favour of shredded cabbage, usually with a choice of sauces such as regular (often just a mix of mayonnaise and ketchup), spicy, and garlic, and often a slice of tomato. Doner kebab is only available in the capital Ulaanbaatar through a fast-food chain "Cola and Kebab". Doner kebab is available throughout much of Seoul, particularly in the foreigner-dominated neighborhood of Itaewon. There are two main varieties: the first, sold from street carts, is modified to suit Korean tastes, with chicken rather than lamb, shredded white cabbage, and honey mustard; the second is offered at permanent takeaways such as Ankara Picnic, Mr. Kebab and Sultan Kebab, and features a lamb option along with more traditional sauces. Doner kebab is known as shawarma (沙威瑪) in Taiwan. It is popular among night markets and streets throughout Taiwan and usually made from chicken and is served on leavened buns with julienned cabbage, slice of tomato, sliced onions, ketchup, and mayonnaise. There is at least one doner kebab shop on the island of Koh Samui. There are many kebab shops around the Nana area on Sukhumvit Road in Bangkok, and in Pattaya on Walking Street. Doner kebab is increasingly becoming popular in Vietnam among the locals. Throughout Hanoi and Ho Chi Minh City many doner kebab stalls can be found, contributing to the local street food variety. Bánh mỳ Doner Kebab, the Vietnamese version of the doner kebab, has some fundamental differences with the original doner kebab. First of all, pork is used instead of beef and lamb. Second, the meat is served in a Vietnamese baguette, which is widely available in Vietnam. Thirdly, the meat is topped with sour vegetables and chili sauce. On contrary with many other countries in Asia, the doner kebab in Vietnam has been localized and is primarily consumed by the locals, while in other countries in the Far East kebabs are primarily sold to expats, tourists and the middle class, and the original recipe is used. In Albania, doner kebabs are usually called sufllaqe and sold at fast-food stores. In southern parts of the country, they are called gjiro. They are made with either pork or chicken, lettuce, tomatoes, mayonnaise, French fries, ketchup or mustard, etc. In general, a normal gjiro in Southern Albania is made with tomatoes, onions, French fries, ketchup, mustard and salce kosi (yogurt sauce). In the capital Tirana, they are made with meat wrapped in freshly made pitta with thick yoghurt and cucumber sauce. Another variant includes a Russian salad dressing rather than salc kosi or mayonnaise. Doner kebab shops can be found in all cities across Austria. Kebabs (rarely referred to as "Döner") outsell burgers or the traditional Würstel (sausage) stands. The range of doner is similar to other German-speaking countries, but chicken kebabs are more likely to be found in central Vienna than lamb or beef kebab. Doner kebab restaurants and food stands can be found in almost all cities and smaller towns in Belgium, where they are known as dürüm when served in a wrap. The variety served is similar to that of Germany and the Netherlands. However, it is not uncommon to see doner served with French fries in Belgium, often stuffed into the bread itself (similar to the German "Kebab mit Pommes"). This is probably done to suit local taste, as fries are still the most common Belgian fast food. Many different sauces are typically offered, including plain mayonnaise, aioli, cocktail sauce, sambal oelek or harissa paste, andalouse sauce, "américaine" sauce and tomato ketchup or curry ketchup. Belgians are renowned for mixing two sauces for maximizing taste effects (e.g., garlic and sambal). Another basic ingredient of the typical Belgian doner kebab is two or three green, spicy, Turkish peppers. Doner kebab stands are a common sight in Bulgaria. The doner kebab or Dyuner (Дюнер) is generally made of chicken meat and wrapped in a flatbread or Turkish wrap. It consist a variety of salad choices most commonly used are tomatoes, chopped lettuce, onions, hot peppers, cabbage and cucumbers. Rice and bean salads are offered along the coastline. In recent years, the use of French fries has become a popular ingredient. It is served with yoghurt-/mayonnaise-based garlic sauce, ketchup or mayonnaise and hot spices. Doner kebabs are a widely adopted fast food choice, and various eateries specialise in the Greek, German and Turkish styles of doner kebabs across the country. In a growing number of cities in Croatia, doners are becoming extremely popular. Kebabs (or kebabi) have received a lot of attention over the past few years, with increasing popularity. In bigger cities such as Zagreb, Split, Osijek and Rijeka, doner stands can be easily found. Cost of a usual doner kebab in Croatia varies from town to town, although average price is around 20 kuna (€2.75) with special and extra ingredients such as ketchup, mayonnaise, pepper, salt or different sorts of salad coming free of charge. Common ingredients are: Beef or chicken meat, salad, cabbage, tomatoes, cucumbers, onions, yogurt sauce. In Denmark, doner kebabs are sold under a variety of names depending on the doner salesman's ethnic background. In Copenhagen, doners are usually sold as shawarma, or simply kebab. Doner kebab was first introduced to Denmark in 1981 by Turkish migrant workers, and has since become a common street food. The most common used meat is lamb. Doner is typically served with lettuce, tomatoes, a créme fraiche dressing and chili oil either in a pita bread, or as a dürüm. Kebab is also served on pizza along with lettuce and créme fraiche or garlic dressing. Doner kebabs have started to gain popularity in Estonia as well. Turkish Kebab restaurants owned by Turkish immigrants. There are Döner kebab places in Tallinn and Tartu. In Finland, kebabs have gained a lot of popularity since Turkish immigrants opened restaurants and imported their own traditional food. Kebabs are generally regarded as fast food, often served in late-night restaurants also serving pizza, as well as shopping malls. There are over 1000 currently active restaurants that serve kebab foods in Finland, making one kebab restaurant for every 5000 people in mainland Finland. Beef is predominantly used, some doners can be a mix of lamb and beef. Unlike in Central Europe, where kebabs are made from whole cuts of meat, practically all available kebab in Finland is made from ground meat. Most kebab shops (themselves known simply as kebabs) are generally run by Turkish or North African immigrants in France. The basic kebab consists of either "pain de maison" (Turkish soft bread) or "pain arabe" (unleavened flatbread) stuffed with grilled lamb shavings, onions and lettuce, with a choice of sauce from sauce blanche (yogurt sauce with garlic and herbs), harissa (spicy red sauce originally from North Africa), ketchup, or several others. Kebabs are usually served with french fries, often stuffed into the bread itself. This variation is called Sandwich grec ("Greek sandwich"). Other variations include beef, turkey, chicken, veal, and replacing the Turkish bread with pita bread or baguette. A version developed to suit German tastes by Turkish immigrants in Berlin has become one of Germany's most popular fast food dishes. Annual sales in Germany amount to €2.5 billion. Veal, chicken, and becoming increasingly more popular, turkey ("Truthahn"), are widely used instead of lamb, particularly by vendors with large ethnic German customer bases, for whom lamb is traditionally less preferred. Typically, along with the meat, a salad consisting of chopped lettuce, cabbage, onions, cucumber, and tomatoes is offered, as well as a choice of sauces like hot sauce, herb sauce, garlic sauce, or yogurt sauce. The filling is served in a thick flatbread that is usually toasted or warmed. A German variety of döner presentation is achieved by placing the döner meat and the add-ons on a lahmacun and then rolling the ingredients inside the dough into a tube that is eaten out of a wrapping of usually aluminum foil, sometimes called "Turkish Pizza". When plain dough is used instead of Lahmacun the rolled fast food is called "Dürüm Döner" or "Yufka Döner." Tarkan Taşyumruk, president of the Association of Turkish Döner Producers in Europe (ATDID), provided information in 2010 that, every day, more than 400 tonnes of döner kebab meat is produced in Germany by around 350 firms. At the same ATDID fair, Taşyumruk stated that, "Annual sales in Germany amount to €2.5 billion. That shows we are one of the biggest fast-foods in Germany." In many cities throughout Germany, "Döner" is at least as popular as hamburgers or sausages, especially with young people. In 2011 there were over 16,000 establishments selling Döner in Germany, with yearly sales of €3.5 billion. Germany's large Turkish community is probably the biggest reason for the widespread sale of döner kebap sales there: from the late 1960s on, large numbers of Turks were invited to come to Germany as guest workers, to help fill the shortage of labour found during the Wirtschaftswunder, after World War II. Many of these Turkish workers eventually stayed in Germany, some opening small food shops and takeaways. In Greece and Cyprus, Doner Kebab is called gyros. The most common form of gyros is prepared with pork, due to its broad availability and low price in Greece and Cyprus, as well as the popularity of pork with the local population. The name comes from Greek γύρος ("turn"), a calque of the Turkish name döner kebap; the dish was formerly called ντονέρ [doˈner] in Greece as well. Today, ντονέρ refers to gyros prepared with lamb or beef and is not common. Doner kebabs are very popular in Hungary since the 1990s but are usually referred to as gyros- even some Turkish restaurants use the Greek term. It is served in two main forms: in a sandwich or on a plate. French fries or pasta are only part of the plate version. The meat is beef, chicken or lamb (the latter is a rarity), and the more popular sandwich version is usually served with lettuce, tomatoes, sliced onion and with some kind of a yoghurt sauce and a mildly hot sauce made of red paprika. In Dublin, increasing numbers of Turkish immigrants have led to growth in the number of late-night kebab eateries, popular with party-goers and evening revellers in the city centre. Doner and other kebabs are often eaten as take-away food after a night out. Owing to demand for late night food in the city centre, large businesses, such as Abrakebabra, remain open very late. Some businesses apply a surcharge to food purchased later at night. Doner is very popular in Italy, especially among Moroccan immigrants and young people, including students and bargoers in many major cities. It is usually called "kebab". The most common toppings are cabbage, lettuce, tomato, onions, hot pepper relish, spiced yogurt, tzatziki, and harissa sauce; a kebab with all the said toppings is referred called a kebab completo. Other common toppings include mayonnaise, ketchup, and French fries. It is also possible to get the kebab without bread in a small foil bowl with all of the toppings over rice. Doner kebabs have started to gain popularity in Latvia as well. Turkebab restaurant chain, owned by Turkish immigrants, successfully opened their second restaurant in Riga. Other private kebab restaurants are run by locals, Egyptians, and Turks. Introduced by Muslim immigrants in the 2000s, doner kebabs exploded in popularity. They are usually sold from small kiosks and carts. Most popular are ones served in lavash bread (Dürüm), though pita bread is also used. The cabbage is the most often used vegetable , along with salad, tomato, bell pepper and cucumber, with a variety of sauces. A Dönerschotel at a snack bar in the Netherlands: sliced "döner-style" grilled veal, French fries, and a simple salad. Doner kebab is very popular and widely available in the Netherlands. As a snack, it is usually served in or with a pita as a "broodje döner" (doner sandwich) with lettuce, onion, tomato slices and sauces, mainly garlic and sambal. A new form of serving, called a "kapsalon", is increasing in popularity from the day it was invented in 2003. It is a metal tray filled with French fries with a layer of doner (sometimes a layer of sauce) over them, topped by a layer of young cheese. This goes into the oven until the cheese melts. Then a freshly sliced salad is put on top of that. The kapsalon is finished with a large amount of garlic sauce and a bit of sambal. The Dutch television programme, Keuringsdienst van Waarde, analyzed doner kebab sandwiches advertised as lamb and found out that only one of them contained 100% lamb meat, while most consisted of mixes of lamb and beef. Some consisted of 100% beef, chicken, turkey or pork. Kebab in Norway is primarily made of mechanically separated meat, served in pita bread with Chinese cabbage, corn and sauce, and is often sold at immigrant-owned fast food restaurants specified as 'kebab shops.' Shawarma is more similar to the traditional European döner kebab, made from lamb meat and served in a roll. It was originally found almost exclusively in central and eastern parts of the capital Oslo, but is now available throughout the country.. In the Østfold border region, the kebab is more similar to the Swedish Kurdish variety. In other parts of the country, kebab, while similar, is more often served in a more generic fast food variety. In Poland kebab is considered one of the most, if not the most popular fast food for young people. A very Polish specialty is a fresh cabbage salad with cucumbers, tomatoes and other vegetables, added to the meat in a sandwich. A basic version costs 9-12 zł (€2–€2.5) and includes pita or thick bread, meat with onion, the aforementioned salad and a choice of sauces. It can be super-sized or served with extra cheese. Sandwiches are available with hot, medium or mild sauces made of house special ingredients. Kebab shops also serve complete meals, vegetarian dishes and ayran. Undoubtedly Łódź is the capital of Polish kebab, with shops run by Turkish Union emigrants, and serving Arab specialties and hookah pipes apart from the sandwiches. Kebabs were rarely seen in Poland before the downfall of the Iron Curtain in 1989. A similar Greek-fashioned dish gyros could have been occasionally encountered in that era. One possible origin of the recent popularity of kebab in Poland is post-communist Berlin, with local Turkish immigrants inspired by their fellow natives in the other country. In Portugal, doner kebabs have been served since the mid nineties. Referred to at the time as "greek sandwiches", and nowadays more commonly as "pita shoarma". They are typically served in thick pita bread. Common ingredients (in addition to the meat) are lettuce, onion, tomato, fresh cheese and various sauces. In Romania, doner kebab and its locally widespread variant, the shaworma, have gained much popularity since 1990, so much so that shaworma has become a fast food staple. In Russia, doner kebab is usually called shaurma (Central Russia) or shawerma (North-West) from the Arabic word shawarma. It is widespread and is usually made in booths or small cafes. There are two basic types: in pita bread or in lavash (thin round flatbread, in which it is wrapped). Types of meat from which it is usually made are chicken and pork. Typical recipe includes meat, cabbage, carrot salad, cucumbers, tomatoes and two types of sauces: ketchup and a type of spicy yogurt. Shaurma can be served also in a plate separate from the bread and can be accompanied with French fries and vegetable salad. Often, it is consumed with light beer. In Serbia, doner kebabs became very popular since the early 2000s and are referred to as gyros . It is served in two main forms: in a sandwich or on a plate. French fries or pasta are only part of the plate version. The most common form of gyros is prepared with pork, due to its broad availability, but there are also a chicken and beef versions available. In Slovenian cities you can find many doner kebab stands that were spread across the country by immigrants from Kosovo and Bosnia years after other countries in Europe, first opened in 2000's. Some places also serve so called jufka kebab (dürüm). Common ingredients are: Beef or chicken meat (and mixed), salad, cabbage, tomatoes, cucumbers, onions, yogurt sauce. In Spain, doner kebabs are common, especially in Andalucía. It is often called chawarma, and kebab restaurants can be found in Granada every 100 metres, with one very famous one in Cordoba being found near the old Mosque. The kebabs are served with chicken or veal and with salad, tomatoes, onions, olives, peppers, white sauce, ketchup, or salsa picante (hot sauce). Falafel, French fries, and fried eggs are typical additions to a kebab. In Sweden, Kebab med bröd (kebab with bread) can be found in the local pizzeria or specialised kebab/falafel shop. The word "kebab" is normally associated with doner kebab made from lamb or beef, less commonly chicken. It is a popular fast-food alternative to the more traditional hot dogs and hamburgers, and is a common late-night post-drinking meal, with kebab/falafel restaurants often being open late into the night. Other commonly occurring kebab variants are kebabrulle ("kebab roll", a roll of flat bread filled with kebab meat, salad, tomatoes, kebab sauce and sometimes peperoncini or sliced pickles), and kebabtallrik ("kebab platter", a plate of doner meat and salad with either French fries, rice, or bulgur). The most common sauce options are "hot", "mild", "garlic" or "mixed", the latter being a mixture of all three. Most pizzerias sell Kebab Pizza—a pizza with doner meat and sauces as a topping. Doner can be found in cities across Switzerland. The doner vendors have popularised the grammatically incorrect way of asking if the customer wants the doner "mit scharf" (i.e., "with hot"). This ubiquitous error originates from a literal translation of the Turkish expression "acılı" and has entered the general usage of German in Austria, Switzerland, and Germany. Introduced by Turkish immigrants, the doner kebab with salad and sauce is a very popular dish in the United Kingdom, especially after a night out. The typical kebab shop or roadside van in the UK will offer hot chilli sauce and garlic yoghurt-style sauce, and may also offer lemon juice, mayonnaise, or perhaps a mint sauce similar to raita. Doner kebabs are most commonly served in a pita bread in the UK, but are sometimes also wrapped in other types of bread - naan bread or roti, for example. Doner meat is also sometimes served as a pizza topping or simply with a side order of chips. In many kebab shops a chicken doner kebab is served as well, being cooked in the same fashion next to the lamb doner. The first doner kebab shop opened in the UK in 1966 in London, and was called the Hodja Nasrettin and was owned by Cetin Bukey. Doner kebab is very popular in Argentina and it's known with the Arabic name "shawarma". In Buenos Aires, specifically in the center of the city (Buenos Aires Central Business District), it's known as a traditional fast food meal (comida al paso) for office workers. It's so popular that it's as famous as other traditional foods as empanadas, milanesa sandwiches or even pizza. Doner kebab is one of the most popular fast-food dishes on São Paulo streets. It is usually served as a sandwich, and it is called "Churrasco Grego", which means "Greek Barbecue", or much less frequently Churrasco Turco (Turkish Barbecue). It is not associated with the kebab/gyro in fashion districts. It is served in Porto Alegre, Foz do Iguaçu where it is sold as Arabic fast-food. A variation known as donair was introduced in Halifax, Nova Scotia, Canada in the early 1970s. Peter Kamoulakos immigrated to Canada in 1959. When he failed in his attempt to sell traditional gyros, Kamoulakos adapted the dish to local tastes. He substituted beef for lamb and created a sweet sauce. He claimed he invented the donair in 1972 and that it debuted at King of Donair's Quinpool Road location in 1973, but this cannot be confirmed. "The Original" Mr. Donair is a company originally started by Peter Kamoulakos to further popularize donair via retail sales and food service. Donair initially gained popularity throughout the Atlantic provinces of Canada, and now there are many variations across the country which differ from the original Halifax donair. Donair meat is sliced from a conical loaf cooked on a vertical spit, made from a combination of ground beef, flour or bread crumbs, and various spices. The sauce is distinctively sweet compared to doner kebabs, being made from condensed milk, sugar, vinegar, and garlic. The meat and sauce are served rolled in a flatbread with diced tomato and diced onion. While not included on "original" donairs, some restaurants add lettuce or cheese as well. Many Canadian restaurants offer a donair pizza featuring all of the donair ingredients served on a pizza crust. In Atlantic Canada one can also find donair meat used in offerings such as donair sausage, donair egg rolls (an egg roll casing stuffed with donair meat), donair pogos (donair meat on a stick, battered and deep-fried, similar to a corn dog), donair calzones/panzerottis, and in donair poutine. In the summer of 2008, after numerous cases of E. coli related food poisoning due to the consumption of undercooked donair meat in Alberta, the federal government came out with a set of guidelines for the preparation of donairs. The principal guideline is that the meat should be cooked at least twice: once on the spit, and then grilled as the donair is being prepared. In addition to the donair, in Canada it is also possible to buy traditional Greek gyros and Arabic shawarma sold under those names at various ethnic restaurants. Doner kebab is available in Georgetown, Grand Cayman with a Caribbean flair. The meat is cooked on the traditional vertical spit, and the kebab is served on flat bread with a variety of sauces, including garlic and mango pepper sauce. Despite a large and established Christian Levantine Arab population having arrived in Chile following the break-up of the Ottoman Empire, the kebab (generally known as shawarma) is a post-millennial addition to Chilean cuisine, following quasi-Tex-Mex, chilenized sushi and Peruvian cuisine crazes. In some cases, third and fourth generation Arab Chileans run restaurants, but more often those preparing the food have no association with or experience in the Middle East, Europe or other established kebab regions. As is common in Chile, franchising has begun in advance of the development of consistent products. In adaptation to the Chilean palate, Middle Eastern spices are minimal. Tahini is rare; garlic mayonnaise or tahini-free hummus being more common. Any chile tends to be mild. Beetroot-pickled turnip is unknown, while unusual ingredients such as tinned mushrooms and mild jalapeños are common. Due to the paucity and expense of lamb and mutton in the more populous parts of the country, beef and chicken (often on the same rotisserie pylon) are usual, as well as pre-fried falafel balls. Sometimes "kebab" will designate a wrap in a thicker, Turkish-style bread, while "shawarma" is used for thin, Levantine pita. A similar dish, where cooked meat grilled on a slit beneath a pineapple is sliced into a corn tortilla, is served in Mexico known as tacos al pastor or tacos de trompo. They can be found all over Mexico, especially in street corners. In Puebla, this was introduced by the numerous Middle-Eastern immigrants, mostly from Lebanon and Syria, but also Turkey and Iraq, in the early 1920s. A similar dish where cooked meat is served in a pita bread (pan arabe) instead of a corn tortilla is known as tacos árabes. The dish originated in Puebla in the 1930s from Lebanese–Mexican cuisine. In the United States, doner kebab is becoming more popular especially in cities with Mideastern immigrant communities, such as New York, Chicago, Detroit, Omaha, Seattle, San Diego, and Los Angeles. In contrast, gyros, considered Greek food, are popular across the U.S., and frequently are found as street carts or mobile stands as fair food as well as at Greek- and Italian-style pizza and sandwich shops. In Australia, doner and other kebabs are very popular due to immigration from Turkey and the Middle East. Döner is sometimes considered to be a healthier alternative to traditional fast food. In Australian shops or stalls, beef, lamb, chicken and falafel doners can be found in all major cities where many suburbs have take-away shops that offer them. They are typically served with a salad consisting of lettuce, tomato, onion and tabouli, and optionally with grated cheese, on either pita (also known in some areas as Lebanese bread) or using thicker but still quite flat Turkish breads. These are sliced in half with the filling placed in between the slices, rather than wrapped, as is common with pita/pide breads. The most commonly used sauces are tomato sauce, barbecue sauce, hummus, tahini, yoghurt, sour cream, garlic, and chili or sweet chili sauce. Doner kebabs in Sydney and Melbourne can be served with all the ingredients placed onto or next to the pita bread on a plate, or more commonly, with the ingredients rolled into the pita bread in the form of a "wrap". The wrapped version can be toasted in a sandwich press, which has the effect of melting any cheese, heating the meat and baking the bread so that it becomes crisp. In Canberra, the bread with filling is passed underneath a grill for a minute. The sandwich is then wrapped in paper to stop the filling from falling out and usually placed in a foil/paper sleeve. This variety is also available in New Zealand. In Brisbane, kebabs are influenced by the Turkish variation. They are invariably served in a pita wrap and toasted in a sandwich press for about a minute before being inserted into a foil or paper sleeve. Shops or vans selling kebabs are colloquially referred to as "Kebaberies" and "Kebabavans" in some parts of Australia. Kebab meat can also be found as a pizza topping in the western suburbs of Sydney and Melbourne, as a "beef pizza" or "Turkish pizza". The "late-night kebab" has become an icon of urban food culture in Australia, with kebabs often purchased and consumed following a night of drinking. Kebabs are considered suitable following consumption of alcohol due their high content of lipids (fats), which aids in metabolism of alcohol. Another variation found commonly in the western suburbs of Sydney and Melbourne is the "snack pack" or "meat box". This is a take-away box with a layer of chips, kebab meat and sauce on top. It is also common to add lettuce, onion, tomato or cheese on top. The "dodgy kebab", often blamed for food poisoning has become more rare since New South Wales food safety best practice recommended a second cooking of kebab meat. Most stores have adopted this measure and it is now common practice in Australia. Second cooking requires that meat sliced from the doner is cooked on the hotplate/grill to 60 °C just before serving. Previously, "dodgy kebab" meat was often sliced from the doner, including some not yet fully heated/cooked meat, at the time of ordering or meat that had been sliced and sat waiting at the bottom of the doner for indiscernible length of time. Doner kebab is popular in many countries in the form of fast food, often as an end to a night out when preceded by the consumption of an excess of alcohol. Health concerns surrounding doner kebab in the UK and Western Europe, including the hygiene involved in overnight storage and re-heating of partially cooked meat, as well as high salt and fat levels, have been reported in the European media. However, Simon Langley-Evans, a professor of human nutrition at Nottingham University states that doner is a healthier choice of fast food, as it brings together meat, wholemeal bread and vegetables. ^ "Hangi İlimiz Nesiyle Meşhur? ~ Tarihi ve Turistik Yerler". ^ Yerasimos, Marianna (2005). 500 Yıllık Osmanlı Mutfağı (500 Years of Ottoman Cuisine) (in Turkish). Istanbul: Boyut Kitapları Yayın Grubu. p. 307. ISBN 975-23-0111-8. ^ Kenneth F. Kiple, Kriemhild Coneè Ornelas, eds., Cambridge World History of Food, Cambridge, 2000. ISBN 0-521-40216-6. Vol. 2, p. 1147. ^ Peter Heine (2004). Food culture in the Near East, Middle East, and North Africa. Greenwood Publishing Group. p. 91. ISBN 978-0-313-32956-2. Retrieved 5 March 2011. ^ "zagkebap.com". zagkebap.com. Retrieved 23 September 2011. ^ "Kebapçı İskender – Yavuz İskenderoğlu". Kebapciiskender.com.tr. Retrieved 23 September 2011. ^ "The Best Iskender Kebab in Istanbul". Culinary Backstreets. ^ donar at street cafe in Baku Azerbaijan | Flickr – Condivisione di foto! ^ "Punkt" (in Deutsch). punkt.kurier.at. Retrieved 23 September 2011. ^ "A kebab restaurant in the mall "Skanssi"" (in suomi). pernionkebab.fi. ^ "Main page statistics (number of restaurants)" (in suomi). kebabille.com. ^ "Kebab restaurant densities by municipality" (in suomi). kebabille.com. ^ "Best Donair". The Coast. Retrieved 20 February 2012. ^ "KOD". KOD. Retrieved 20 February 2012. ^ Bill Power (October 29, 2014). "Tony's Meats Expanding Donair Domain". Halifax: The Halifax Chronicle Herald. Retrieved 19 January 2015. ^ "Health Canada". Health Canada. Retrieved 20 February 2012. ^ Tacos!, Kitaddoda.com. Retrieved 26 January 2007. ^ Doner kebab houses in New York. Retrieved on 21 March 2009. ^ Döner Kebab House, Chicago, IL. Retrieved 21 March 2009. ^ Amsterdam Falafel and Kabob. Retrieved on 12 July 2013. ^ The Berliner Doner Kebab Seattle, Retrieved 14 August 2011. ^ The Kebab Shop. Retrieved on 9 September 2009. ^ Spitz in Eagle Rock, CA. Retrieved on 21 March 2009. ^ "Doner kebabs". NSW Food Authority. 27 May 2011. Retrieved 23 September 2011. ^ a b c "How unhealthy is a doner kebab?". BBC News Magazine. 21 January 2009. ^ "UK study reveals 'shocking' kebab". BBC News. 27 January 2009. ^ "Results of council survey on doner kebabs". LACORS. 27 January 2009. Cardin, Geoff (July 29, 2011). "The Dish: Döner Kabob". Feast Magazine. Retrieved 2013-04-18.